Teachers have occupied a Dublin English language school in protest at unpaid wages. The company, Grafton College, went into liquidation today leaving staff suddenly without jobs and owed one month's pay. The teachers say they are also protesting at precarious work practices in the industry. 25 teachers entered the Grafton College building after a protest held outside the private school. They say they are occupying it in an attempt to get monthly wages that they were due to be paid last Friday. The teachers say they also want to draw wider attention to the issue of precarious work practices in the industry in general. 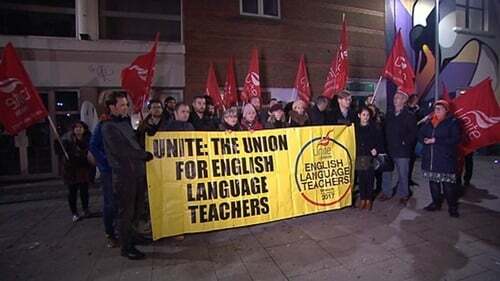 Trade union Unite, which represents English Language Teachers, has said it supports the teachers and their occupation. The teachers are demanding that Minister for Education and Skills Joe McHugh visit the college and speak to them. They are also demanding that the Qualification and Quality Assurance bill designed to regulate the sector, which is currently making its way through the Oireachtas, be fast-tracked and amended to include minimum standards of employment for teachers. Unite Regional Coordinating Officer Richie Browne pointed out that Grafton College is just one in a series of colleges which have closed overnight leaving both teachers and students high and dry. Marketing English in Ireland said the school, which caters up to 500 international students, will close its doors for good this evening. Staff at the school have been unable to contact Grafton College's London-based owner after monthly wages were not paid on Friday. The school's director held a conference call with the owner today, and the liquidation of the company was announced following the call. A meeting was held at the school this morning between teachers and management after students and teachers were told there will be no classes for the foreseeable future. In total 35 staff say they have been told that their jobs are gone just weeks before Christmas. The company behind Grafton College has three directors listed with the Companies Registration Office. They are Saeed Rehman, with an address in Lucan, Nicholas Christopher Kelly of Bray, Co Wicklow, and London-based Uzma Saeed. Saeed Rehman is listed in a student's handbook as CEO of Grafton College. Teachers know him as the owner. The CRO lists Uzma Saeed as the company's sole shareholder. Speaking to RTÉ News, teachers said they have no idea what is going to happen and they had no idea if they will be paid the wages they are owed. One teacher said that he had got married last Saturday and the couple are expecting their first child shortly. The teacher said he is owed two months' wages from the school. Students said that they had paid fees of €2,000 to study at Grafton College. MEI has said it is putting contingency arrangements in place for students so that they could move to other schools. The English language teaching sector has been blighted over the last number of years with some schools closing down without notice overnight. The union Unite has called on the Government to fast track the Qualification and Quality Assurance bill with suggested amendments to tighten up protections for teachers.